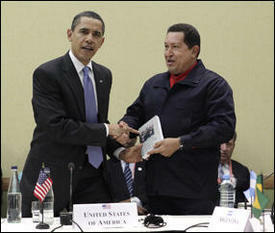 Venezuelan President Hugo Chavez has announced that he is restoring his country’s ambassador to Washington. After exchanging greetings with US President Barack Obama at the Americas Summit in Trinidad and handing him a Spanish-language copy of Uruguayan writer Eduardo Galeano’s book Open Veins of Latin America: Five Centuries of the Pillage of a Continent, the Venezuelan premier voiced hopes of beginning a ‘new era’ in relations – and said that he had already chosen the new envoy. Mr Chavez expelled the US ambassador from Caracas in September in solidarity with Bolivian President Evo Morales, who ordered the top US diplomat out of his country for helping the right-wing opposition incite violent anti-government protests. Washington hit back by kicking out both countries’ ambassadors. Mr Chavez said: ‘I have spoken with former foreign minister Roy Chaderton and I have designated him as the new ambassador to the United States. The US State Department said later that it would ‘work to further’ diplomatic relations. Latin American leaders, including Brazilian President Luiz Inacio Lula da Silva and even Colombia’s ultra-right President Alvaro Uribe, pressed Mr Obama to scrap the illegal 47-year-old blockade of Cuba. But Mr Obama rejected the calls to lift the blockade, saying only that the US is on a path towards ‘changing the nature of its relationship’ with the socialist country. Mr Chavez and Mr Morales said that they would not sign the summit’s final declaration in protest at the fact that it excluded Havana.